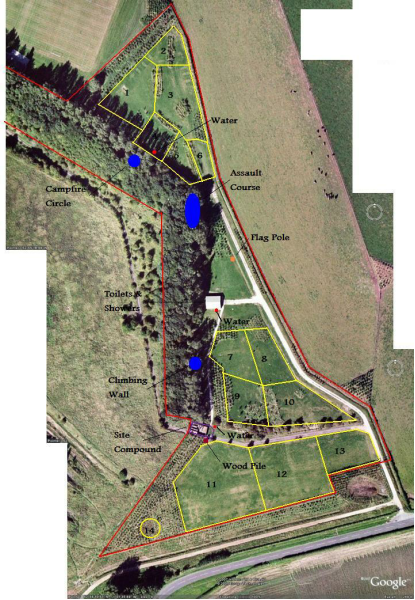 The site comprises 7¾ acres of camping ground with an additional 2 acres of mixed established woodland. There is a high quality toilet block on the site that provides hot showers and washing up facilities. There is a "campers utility room" which has a fridge, freezer, tumble dryer and microwave. All campers have access to this and there is no extra charge. The site has a campfire area and an assault course together with a supply of pioneering poles that can be hired. A small climbing wall (approx 6 metres) is also available for hire, along with all necessary equipment. We can no longer provide instructors but if you have your own (we will need to see proof of qualification) you can make use of this for a small fee. A simple orienteering course has been laid out and maps are available. We also have available a pair of football goals (and some footballs) and a number of frisbees. A small tuck shop selling a range of sweets and camp badges can also be provided if required. Cooking on wood is encouraged using the altar fires provided. There is a good supply of firewood making this site ideal for traditional Scout camping. We also have an area of the site designated for ground fires/trench fires etc so that some real Scout firelighting skills can be practised. Some of the facilities are marked on the site plan.